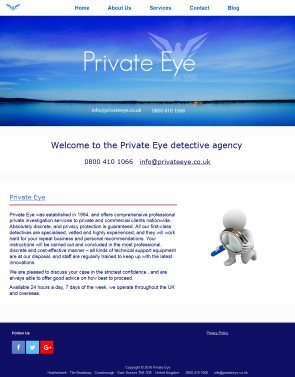 Private Eye detective agency was established in 1994, and offers comprehensive professional private investigation services to private and commercial clients nationwide. Absolutely discrete, and privacy protection is guaranteed. All our first-class detectives are specialised, vetted and highly experienced. Based in South East England, convenient for London, Private Eye Detective Agency investigates throughout the UK.